Немножко грустная. Может быть, ей комаров не хватает? Или кто-нибудь обидел. 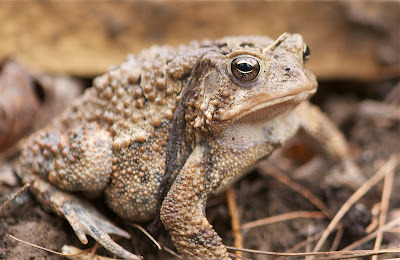 Yep, this is a remarkable frog called a toad. He lives in moist areas. Not sure he will make it in my garden though because it gets pretty dry in the summer. But it was so much fun to make his acquaintance this morning. Our cat Toto was in the garden too when he came into view. Luckily she didn't see him or it would not have been a happy ending.